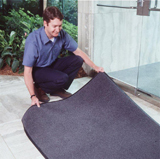 Dust Control in the Workplace | Ace Uniform Services, Inc.
Dust control mats are a great way to protect your employees from the dangers of dust in the workplace. Dust is present wherever there is air. We can usually spot it when it collects and settles on flat surfaces or when it forms dust bunnies under furniture. However, individual specks are usually invisible to the naked eye and are always there. Dust contamination is a significant problem in the workplace. Airborne dust can pose a lot of problems when inhaled, potentially causing occupational disabilities in your employees. For those in heavy industry such as the rubber, automotive, paper, plastics, and pharmaceutical industries, dust can even have the potential to trigger explosions. Its low surface area means that an explosion can be unpredictable once a certain level of concentration is reached in the air. Dust can lead to fatal consequences in this way as well as through regular inhalation, so what steps can a business take to control it? Training your employees to maintain a clean workstation is a critical first step towards improving dust control in your work environment. Many in the manufacturing, medical, and construction fields can use microfiber towels to wipe away dirt and dust more effectively than regular cotton towels. Microfiber towels can attract and remove an average of 5 times more dirt and dust than a standard towel. Dust could be hiding anywhere in your business and not necessarily in plain sight. Using mops is a great way to ensure that those hard-to-reach places will get clean too. Reducing dirt and dust on your floors will not only help prevent their fatal consequences but also means your employees and customers will be less at risk of slipping and falling. Mats are another crucial step in controlling dust in your workplace. Specially designed dust control mats help trap dust in high traffic areas, reducing the amount that enters your business from the outside. These mats can be branded or designed to fit in with the professional appearance of your business. If you need help controlling dust at your company, contact us here at Ace Uniform! To give your hospital or business a clean, professional, and cohesive look, rely on Ace Uniform. Whether you need uniforms in the food, automotive, industrial, construction, medical, security, or you-name-it industry, we can provide you with the uniforms you need for the price you want. We also have dust control solutions to keep your workplace clean and your employees and customers safe. Give us a call at 1-800-366-1616 or visit us online to learn how we can help meet your needs. Want to get to know us even better? Visit us on social media on Facebook, Pinterest, Twitter, LinkedIn, and Google+. This entry was posted on Friday, January 6th, 2017	at 10:26 am	. You can follow any responses to this entry through the RSS 2.0	feed. Both comments and pings are currently closed.